iBlueDrive technology operates with a new intelligent working mode 'mode i', which allows the automatic switching between continuous and strobe lighting. This way, you will be able to operate in strobe mode with the same device just as easily as you do in continuous. iBlueDrive technology integrates in one device all advanced functions of a strobe controller. This allows us to have extended information about lamps operation and, therefore, to self-protect the device against misuse. The iBlueDrive lighting systems incorporate all functions of an advanced strobe controller. As it is integrated next to LEDs, more information and higher response speed is obtained giving rise to a better control. With iBlueDrive devices you will save implementation costs both programming and installing. Moreover, an iBlueDrive system is more economical than a conventional equivalent system plus its strobe controller. 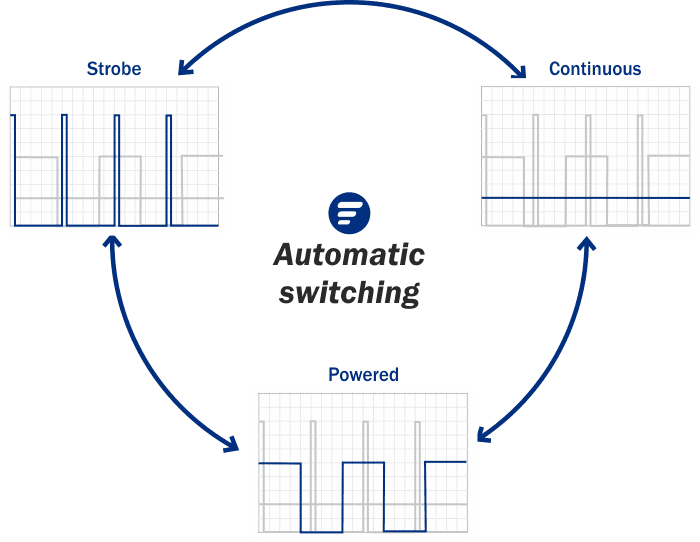 Lighting systems with iBlueDrive technology automatically detect the input signal and set its maximum output power according to the operating mode, no matter if it is strobe, powered or continuous mode, being unnecessary to configure or change anything in the device. Connecting the lamp to the computer will provide you with advanced information such as: serial number, order reference, current operating mode and its status, power voltage or driver and device temperature. You will also be able to configure parameters as the pulse width, the dead time after shooting or the output power among others. Intensity of light vs. Operating time ON graphs.